No joke, I’ve been on the hunt for the St. Tropez Purity Bronzing Water Mousse for months now! I first spotted it at the Avenues and even took a few photos of it (here) for my blog, but didn’t actually purchase it then and there. I went back shortly after to pick it up, but it was gone, girl, gone! I’ve searched every single branch of Boots for that stuff, ever since! 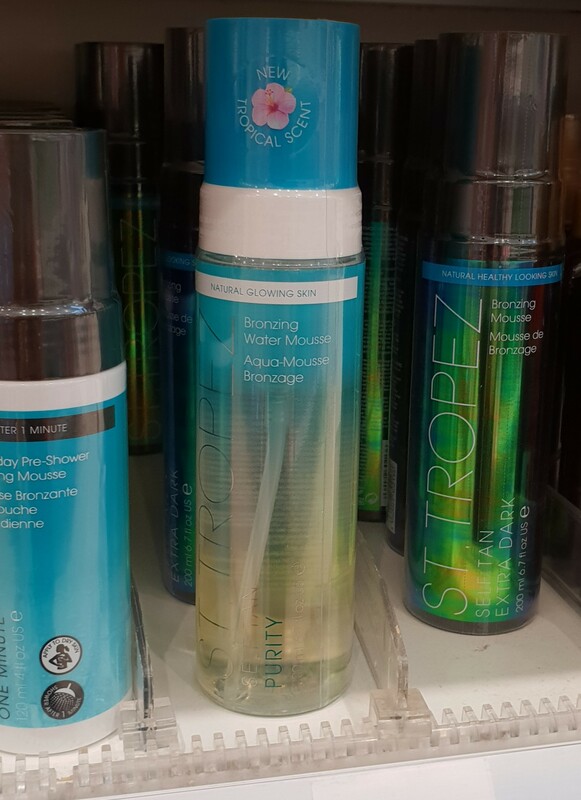 Finally, several months later, I found a whole display of St. Tropez Self-Tanning stuff at the Marina Mall branch of Boots! It looked pretty new! What’s more, is that they had that same “Buy 2, Get 2 Free” promo going on! Rather than risk not finding this stuff again (lesson learned), I hurriedly snatched up x2 of the Purity Bronzing Water! Since I qualified for x2 more bottles of St. Tropez stuff for free, I snatched up the pretty one with oil-slick packaging which was in Extra Dark and the regular one in Dark. Considering these babies retail for around KD 20 a pop (give or take), I thought it was fair that I only ended up paying KD 45 in total! 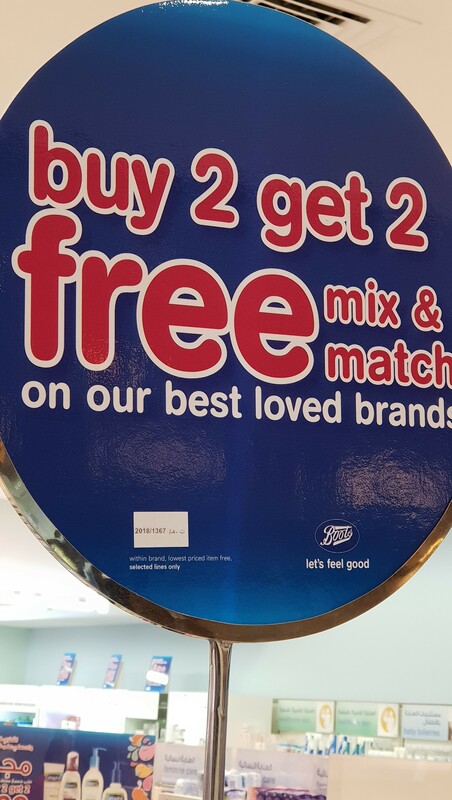 As you can see, it clearly states “Buy 2 Get 2 Free” and also “Mix & Match“. However, just to be 100% sure, I asked the nearest SA and she also confirmed that I could in fact mix & match (each item could be from a different brand and I’d still qualify for the Buy 2 Get 2 promo), store-wide. I knew Kuwait all too well, so I was skeptical (because it sounded too good to be true). However, I went along with it and filled up my shopping basket anyway. I wasn’t that interested in anything (bad mood) up until I spotted the St. Tropez display, which showcased all kinds of new products from the brand! I mean… they had the Gradual Tan 1 Minute Everyday Pre-Shower Tanning Mousse (which you’re supposed to wash off after literally just 1 minute!) and the Self Tan Purity Bronzing Water Mousse (Bronzing Water! I die!) and the one in the gorgeous oil-slick packaging is the Self Tan Extra Dark Bronzing Mousse. They also had the rest of the St. Tropez range (about 3 rows of the stuff) including the Bronzing Lotions and Facial Oils and even the Tan Applicator Mitts! I so rarely shop at Victoria’s Secret, for varied reasons. Clothes-wise, I don’t believe they’d have anything that would fit me. That said, I’ve never actually tried anything on in their dressing room. In fact, I’ve never even so much as glanced at their clothes or lingerie, my logic being that the Victoria’s Secret Angels are all incredibly fit, long-limbed, size-zeros, whereas I am neither slim nor tall. Makeup-wise, I’ve had several bad experiences with them in the past (as a teenager). One in particular, stands out to me; when I purchased a Lip Plumper, and instead of being a clear gloss that tingles, it was a thick (yet creamy), straight up white lipstick, with a matte finish, regardless of the fact that you applied it with a doe-foot applicator, straight from the long mascara-like tube. Apparently, you were supposed to apply it as a base (underneath a lipstick or lip gloss), and it was supposed to smooth out the surface of your lips, which in turn would make them appear bigger. Victoria’s Secret were very careful with their wording on the packaging. In fact, back in the day, a lot of makeup companies used to pull all kinds of shady stunts like that, before beauty bloggers and vloggers exploded on the scene. I’ve also purchased several hair-care products from them and was always disappointed. For instance, when I purchased a scented mousse, it was so sticky it made my hair stick together as well as stick to my scalp. I wanted volume in my hair but instead the mousse gave me a bad hair day (sticky, stringy, and flat). What’s worse was it was a floral-scent (no testers)! Scent-wise, they had such a huge selection of perfumes, body mists, and whatnot, that I was always overwhelmed, and never knew where to even begin. Now you have the power to have a safe, golden, perfectly-even tan. Our All-Angle Airbrush Tan leaves skin satiny smooth with no messy hands or streaks in the aftermath. 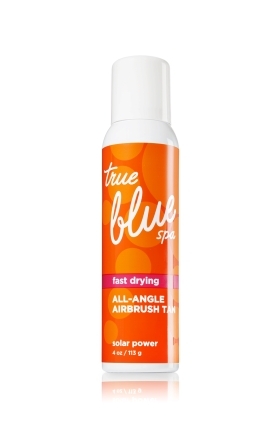 Best of all, new airbrush technology lets you spray at all angles so doing it yourself is easy. Finally a professional-looking tan without letting the professionals see you naked.